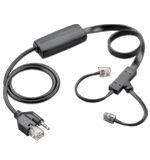 This is the Plantronics APC-43 EHS cable for for remote desk phone call control (answer/end). This cable eliminates the need for a HL10 Handset Lifter.This cable works with Cisco IP Phones. Also compatible with Panasonic KX-UTG300/200 phones . 1) The phone must be set for “Wireless Headset Hookswitch Control"
2) Press the settings button on the phone (Checkbox Icon). Select "Device Configuration" -> Select "Media Configuration"
1) Access the Cisco server administrator with a browser.